There has been a consistent thread in Zionism that has called for the ethnic cleansing of Palestinians for over 100 years, and this thread has dominated both secular and religious Zionists on the grounds of creating and maintaining a majority Jewish state. Theodore Herzl, an atheist Jew, who is considered the father of political Zionism, advocated for the expulsion of the Palestinian people when he helped launch the Zionist experiment. Over 100 years later, there are millions of displaced Palestinians and millions of others who are under a brutal Israeli military occupation, and the calls for ethnic cleansing continue not only by secular Israeli Jews but religious Israeli Jews. It must be emphasized again that this is not an individual who is on the fringes of Israeli society. 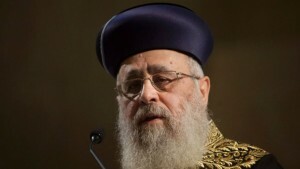 He is the chief rabbi of millions of Israelis who feel the exact same way. Moreover, just like Theodore Herzl and the early Zionists who set the seed of racism and ethnic cleansing, a majority of Israelis want Palestinians expelled from the land. That is alarming, given that the Israeli government has life and death power over the Palestinians and right wing crazy Israeli settlers walk around Palestinian neighborhoods brandishing their weapons and terrorizing Palestinians. Unfortunately, the United States is Israel’s enabler and we give them billions of dollars in weapons every year. One only need look at the embarrassing way our politicians grovel to the influential pro-Israel lobby (AIPAC), which has a stranglehold over US politicians. Have you ever wondered why most politicians fawn over Israel? It is because AIPAC can make or break a candidate if it deems him/her to be nonconformist to anything Israel. Yet, Americans also have a strong social justice fabric and if Americans new the nastiness of Israel’s treatment of the Palestinians, we would collectively call on the boycott, divestment and sanctioning of Israel until it conforms to international law.